jtower.com – ASP.NET 5 is Dead; Long Live ASP.NET 5! Perhaps you’e read the news last week from Scott Hanselman already, but if you haven’t, allow me to bring you up to speed. ASP.NET 5 is now know as ASP.NET Core 1.0. Note that this name change does not indicate that it has been released. That happy event is still expected in the next few months. To some, the change may seem like a meaningless marketing change, but I’m thrilled about it. I think the new name more clearly represents the important same-ness and important different-ness of this new version of ASP.NET. I’ve been doing talks about this new version of ASP.NET, and I’ve found it difficult to explain. ASP.NET Core 1.0 is actually a new framework rewritten for the .NET Core Framework (though it also works with the full .NET Framework). ASP.NET 4.6 was also released recently, and it is an evolution of previous versions of ASP.NET and built only for the full .NET Framework 4.6. If we parse out the pieces, I think the name ASP.NET Core 1.0 more clearly represents that this is a fresh rewrite (“1.0” instead of “5”) and that it was written for a whole new framework (“Core”). Importantly, though, the new name also captures the sameness. ASP.NET Core 1.0 still includes “ASP.NET”. That’s no mistake. Even though a lot changed under the hood, a lot of developers will hardly notice the difference. This new version still includes all the ASP.NET MVC goodness you’ve come to know and love. If you’re used to creating MVC applications, you’ll hardly miss a beat in ASP.NET Core 1.0. One of the best things about ASP.NET Core 1.0 is that it is portable to other platforms, such as Mac and Linux. 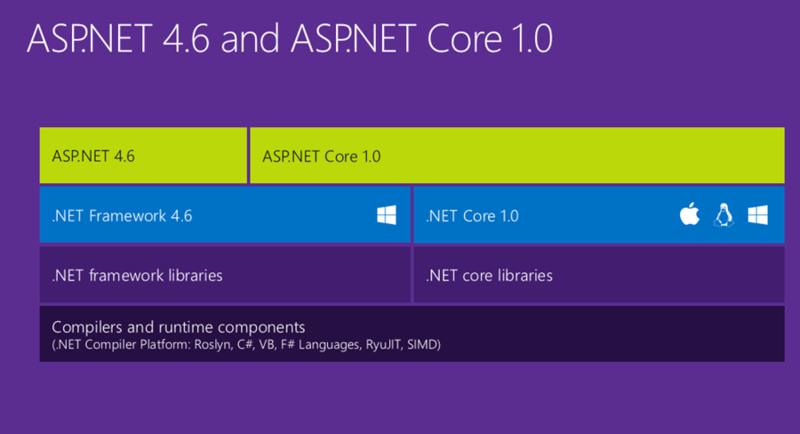 Note, though, that ASP.NET Core 1.0 isn’t released yet, but ASP.NET 4.6 is available today. Both are very valid choices, but in the cross-platform world we live in, it’s very exciting to have a truly portable option for ASP.NET. OS 7 was Apple’s leap into the world of flat design and was, from a consumer acceptance perspective, more successful than Microsoft’s. Skeuomorphism was declared dead on the spot – the new metaphorical, rich flat design was the way forward.